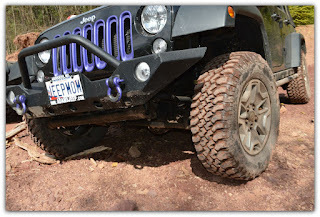 Last June I researched the differences between the 2 door Wrangler and the 4 door Wrangler when it came to off-roading. One of the differences is the 2 door has better break over angle, which makes it less likely to high center when cresting over hills. I found out first hand two weekends ago this doesn't mean the 4 door cannot do what the 2 door can. It just means the 4 door needs a little more help. There is an obstacle at Rausch Creek, a steep rock hill. I was the first in our group to climb up the rock. I knew before I hit the hill, I would not be able to go all the way up and over. This was because I was a stock 4 door Wrangler. 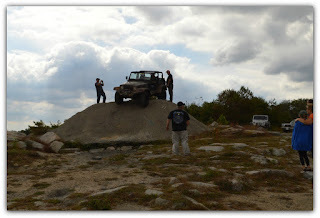 As you can see in this video I couldn't even make it to the top because my rear bumper was all ready scraping the ground. But that did not mean a 4 door Wrangler could not make it over. 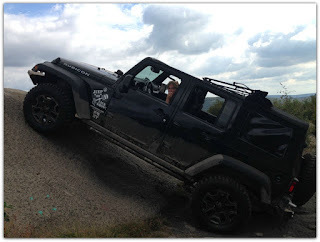 After watching a couple of 2 doors hit the hill and make it up and over a 4 door Wrangler in our group decided to attempt the hill. This Wrangler was lifted and had larger tires, but so did those 2 doors. The 4 door Wrangler went up and over with just centimeters to spare once he was at the top. But the 4 door Wrangler made it. Some day when my Wrangler has the extra help I may attempt this obstacle. It certainly won't be my Jeep Wrangler that will hold me back, but my fears that will. Watching the Jeeps come down that hill was very nerve racking. 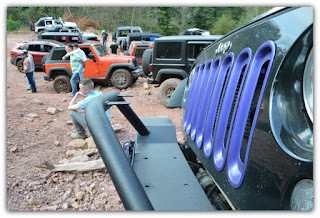 It wasn't just me who was a little on edge several of the Jeepers in our group opted out of the obstacle.